This case challenges the MTA’s failure to install elevators at all New York City’s subway stations. DRA has a second, related case challenging the MTA’s failure to maintain the few elevators that currently exist. On April 25, 2017, DRA filed a class action lawsuit against the New York City Transit Authority (“NYCTA”), Metropolitan Transit Authority (“MTA”), and New York City (“the City”) for their failure to make the subway system programmatically accessible for persons whose mobility and other disabilities restrict them from using stairs. The City’s subway system has long been City’s lifeline, enabling over 6 million people per day to participate in its economic, political, cultural and civic life. Indeed, an average resident of New York depends on subways to carry out a vast array of essential tasks every day of his/her life. 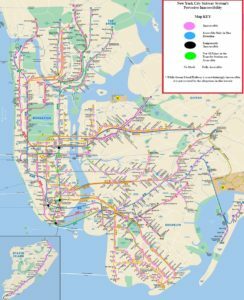 For people with disabilities, however, meaningful access to the subway system has remained all but illusory. The rare accessible stations tend to be spaced out by at least 30 blocks and constitute less than 20 percent of the total number of stations. In numerous parts of the City, residents with disabilities have no access whatsoever. As a result, they remain completely barred from a mode of transportation that has shaped City’s life in a way that is unparalleled elsewhere in the country. DRA’s ultimate goal is to ensure that the Defendants institute a comprehensive remedial scheme that can meaningfully address this devastating exclusion of people with disabilities from one of the nation’s largest and most important public transportation systems. The case is scheduled for oral argument on March 5th, 2018, at 10am at the New York Supreme Court located at 60 Center Street. The MTA has filed a motion to dismiss the entire case. Judge Shlomo Hagler set a time for all the parties to appear and argue why or why not the case should be dismissed.